If you are a ClickBank promoter to promote your products, you can easily observe your efforts by setting up Google Analytics tracking service. As you know Google Analytics is a free service that helps to get valuable information how customers act with your ClickBank product page. For example: with Google Analytics program you can get information about how many peoples visit your page on weekly and daily basis. You can also know their geo location, visit length, reach time, exit time and many more. With Analytics information you can calculate how much attention a particular product receives and which product page need extra effort for marketing. SEE ALSO: How To Host Web Scripts Or Files On Google Drive? Isn’t it important to setup Google Analytics tracking service for your ClickBank? Of course it is. So let’s see how to set up Google Analytics for ClcikBank. 1. Go to Google Analytics page. 2. Log into with your Google account. 3. Click the Admin tab and click New Account link under Account drop down. 4. Click Website button and fill the required information below. Such as: website name, category and desire title. Enter your ClickBank product page URL in website URL field. 5. After filling information click Get Tracking ID button. You must select I Accept to agree Google’s ToS. 7. A tracking script code will be appear. Copy that code. 8. Go to your ClickBank product webpage and edit your page in HTML mode. 9. 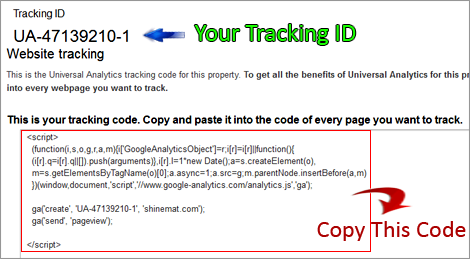 Now paste your Google Analytics Tracking code just before/ above </head> tag. 10. Finally save your ClickBank webpage and publish it. Now you will get all visitors data from your Google Analytics account who engaged with your ClickBank product page. Hope this helps. If you like this post must leave your opinion below. Stay well pals. Allah Hafez.